Died: October 6, 2003 in Operation Iraqi Freedom. Unit: Army, 1st Battalion, 32nd Infantry Regiment, 10th Mountain Division, Fort Drum, N.Y.
Second Lt. Richard Torres saw the military as a good way to enhance his life. He joined the ROTC program at Austin Peay State University in Tennessee so the Army would pay for his education, and his ambition was to teach military science at West Point. "His dream was to retire in the military and get his master's and teach at West Point," his wife, Linda Torres, said yesterday. "He said he wasn't going to stop until he got his doctorate. He said, 'Watch, one day, I will be the president of the United States.'" But like every soldier, Torres knew he would have to give something, too. This week he gave his life. Torres died Monday night when his convoy was hit by an explosive device in Baghdad while serving in Operation Iraqi Freedom. He was 25. Torres was leading a platoon as part of his assignment to the 1st Battalion, 32nd Infantry Regiment, 10th Mountain Division based at Fort Drum, N.Y. Torres was deployed to Iraq on Sept. 2 and kept in touch with his wife throughout his short stay in the Mideast. "We had three phone calls and three e-mails," said Linda Torres during a telephone interview at her brother-in-law's house in Passaic. "He said the weather was hot. (He said) it was getting kind of dangerous and everything was going to be okay." Friends said Richard Torres looked forward to his first opportunity to serve in combat because it would give him the chance as an officer to direct soldiers in battle. "He was somewhat excited about the mission his unit was ordered to do," said Lt. Clifton Schmidt during a phone call from Fort Bliss, Texas. "All he wanted to do was make sure he got all his people to come home safe and alive. "He was doing everything he could to make sure his guys were trained. He wasn't the kind of guy to sit in the back and give orders. He would go out with his soldiers. He wanted to know what his soldiers were going through so he could make the best possible decision." 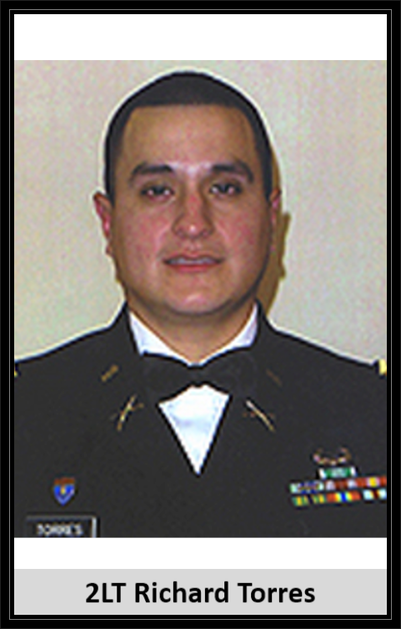 Torres grew up in Passaic, the son of Peruvian immigrants Dora and Gulian Torres, and during his childhood he discovered his interest in military service. "He would always tell me he used to like collecting GI Joe figures and wanted to be one of them," said Linda Torres. "He knew his parents came from Peru and worked in a factory. He wanted to better himself and didn't want to become a burden. He wanted to become independent." It was also during his childhood that he found another important component in his life: his wife of four years, Linda. The two, who are both of Peruvian ancestry, met as freshmen at Passaic High School where Torres played basketball and graduated in 1996. Torres joined the Army out of high school and was sent to Fort Campbell in North Carolina, where he rose to the rank of sergeant and met another young couple who would become close friends: Clifton and Ualani Schmidt. "He was a very giving person throughout school," said Schmidt. "(There were times when) we were both broke and we took care of each other. Whenever he was lacking, we helped out. Whenever we were lacking, they would help us. He never said no anytime we needed anything." The friendship became stronger when they both entered the ROTC program at Austin Peay in 2000. Torres gained the respect of his teachers and peers quickly, as he maintained a 3.8 grade-point average. "He was outstanding, very smart and methodical," said his former military science professor Lt. Col. Pat O'Hara. "He was one of the best cadets we had here." Torres eventually tested his leadership skills during his senior year when he and Schmidt trained underclassmen in the program. "He was real adamant and passionate about just doing the right things and that things were done to standard and making sure other people were doing things the way they should be done," Schmidt said. Torres graduated with honors from the university in May 2002 and stayed with the program as a recruiter. "He spent time finding young men and women (to recruit for the ROTC program)," O'Hara said. "I used to tell him to find young men and women like him." Torres was eventually transferred to Fort Benning in Georgia, where he received his officer training before he was assigned to Fort Drum. Torres' family members were notified Tuesday afternoon of his death and are planning a wake and funeral for this weekend. His wake will be held tomorrow and Sunday at Alvarez Funeral Home in Passaic. A funeral Mass will be offered Monday at 10 a.m. at Holy Trinity Church in Passaic. Torres will be buried at East Ridgelawn Cemetery in Clifton. Despite the overwhelming support from family members and friends over the past week, family members are still having trouble adjusting to his death. In addition to his parents and wife, Torres is survived by a brother, Stewart. Army 2nd Lt. Torres was assigned to 1st Battalion, 32nd Infantry Regiment, 10th Mountain Division, Fort Drum, New York. Torres was leading a platoon on combat patrol when an improvised explosive device hit his convoy. Richard grew up in Passaic, the son of Peruvian immigrants. During his childhood he discovered his interest in military service and liked collecting GI Joe figures. He wanted to better himself and didn't want to become a burden to his parents. He attended Passaic High School where he played basketball and graduated in 1996. Richard joined the Army out of high school and was sent to Fort Campbell in North Carolina where he rose to the rank of sergeant. He eventually attended Austin Peay State University, Clarksville, Tennessee, where he held a double major in political science and history and graduated in May 2002 with honors. He joined the ROTC program at Peay, where he won several awards, so the Army would pay for his education. His dream was to retire in the military, get his master’s and teach military science at West Point. He was proud to be the first person in his family to graduate from college. After graduating, Richard went to Fort Benning, Ga., to attend the Infantry Officer Basic Course. He was most recently assigned to the 10th Mountain Division. After a month at Fort Drum, training in urban operations for Afghanistan, his unit deployed to Iraq where he had been for about two months. He was excited about the mission his unit was ordered to do. All he wanted to do was make sure he got all his people home safe and alive. Richard was posthumously honored with a Purple Heart and the Bronze Star. He is survived by his wife, Linda.